An automotive dealer purchased hundreds of 30 pound refrigerant cylinders for use in recharging automotive air conditioners. One of the cylinders is shown in Figure 1. As they were put into use, nearly half of them were found to contain no product at all – they were empty fresh out of the box. Did the supplier ship them empty? 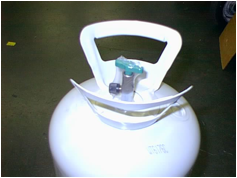 A review of their records showed that they were filled at the factory, so how did the refrigerant get out? One of the empty cylinders was re-pressurized with air and a very small leak from its valve was discovered using a soap water solution. Each cylinder had a hand operated shut off valve. The entire valve assembly was covered with a thin clear cellulose shrink wrap. Many of the cylinders were also fitted with caps on their discharge ports. The leaky valve was sectioned in half for examination, but no damage was found. What if the valves opened after the cylinders left the factory? Five empty and five full cylinders were selected and the valve handles tested for tightness. The valves on the empty cylinders had an average tightness of 14 in-lbs torque, and the valves on the full cylinders averaged 24 in-lbs. Thus, the valves on the empty cylinders were loose. They were tight at some point though; review of factory records shows that the valve tightening torque was specified between 30 and 40 in-lbs. The cylinders were shipped in cardboard boxes, none of which showed any signs of damage. Likewise, the cellulose shrink wrap showed no signs of damage. The valves were not loosened by external force after they left the factory. The most probable cause of the loosening was the application of the cellulose shrink wrap at the factory. The shrinking created unbalanced forces on the valve handles, in some cases high enough to loosen the valve to the point of leakage.